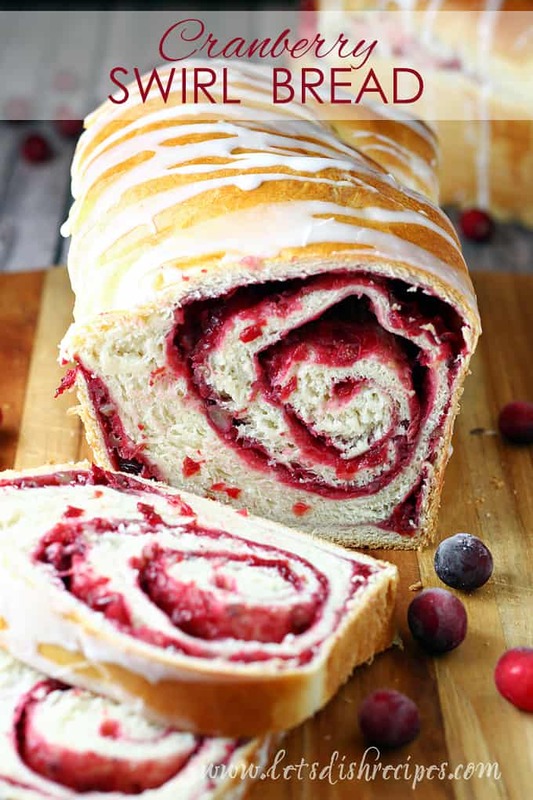 CRANBERRY SWIRL BREAD — A delicious yeast loaf with a pretty cranberry pecan swirl throughout. Perfect for the holiday season. Oh my heavens! 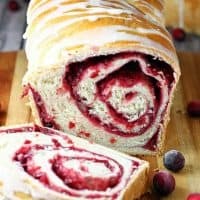 This beautiful Cranberry Swirl Bread may be the best thing that ever happened to the humble cranberry. And I love all things cranberry, so that’s really saying something! Unlike most cranberry breads, this is a yeast based loaf, which makes it incredibly hard to resist. I may have eaten three slices for breakfast alone. And besides being tasty, the cranberry nut swirl is just so pretty! This did make a large loaf (bigger than I expected), so do use a full size loaf pan. Not that I’m complaining. In fact, this bread was gone so fast, next time I’m going to double the recipe! I topped my loaf with a simple, powdered sugar glaze, but even without that, this bread was amazing. I’m thinking it would make some fabulous French toast too! And if you can bear to part with it, this Cranberry Swirl bread would be a perfect holiday gift for neighbors and teachers. Everyone is always so impressed with how pretty the cranberry swirl looks when this bread is sliced. In fact, it could easily pass as one of those expensive, fancy loaves from a gourmet bakery. This bread definitely looks and tastes professionally made! 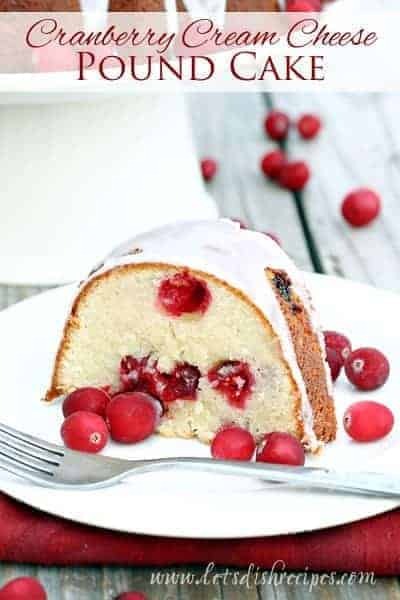 Be sure to add this Cranberry Swirl Bread to your fall baking line-up. This beautiful swirled yeast loaf will definitely become a holiday tradition at my house! 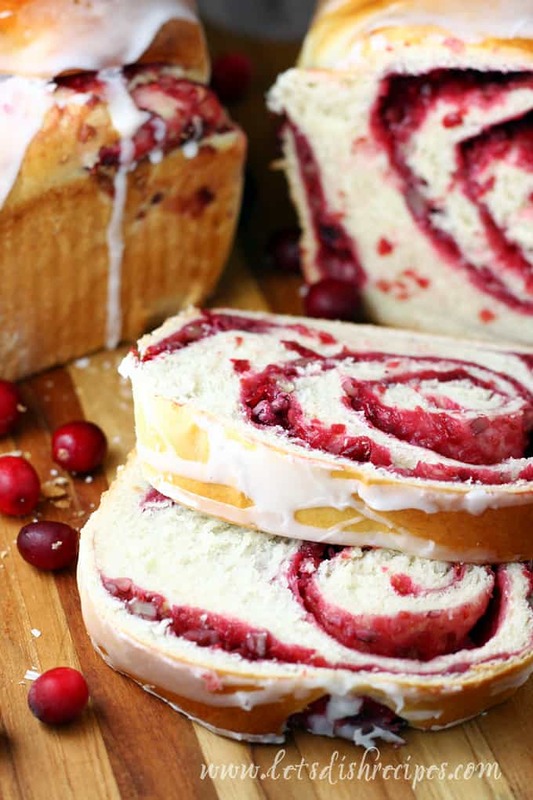 Be sure to save this Cranberry Swirl Bread recipe to your favorite Pinterest board for later. A delicious yeast loaf with a pretty cranberry pecan swirl throughout. Perfect for the holiday season. In a large bowl, mix sugar, yeast, salt and 1 cup of flour. In a small saucepan over medium heat, heat water, milk and butter, until butter is melted. Cool until mixture is lukewarm (about 120 degrees). Add liquid to dry ingredients and beat on medium speed for 2 minutes. Stir in enough flour, one cup at a time, until a smooth dough is formed (you may not use the last 1/2 cup). Turn dough onto a floured surface and knead until smooth and elastic, 5-6 minutes. Place dough in a greased bowl. Cover with plastic wrap and let rise in a warm place until doubled, about 1 hour. Meanwhile, in a small saucepan, combine cranberries, brown sugar, cornstarch and water. Cook over medium heat until mixture thickens and cranberries burst, 10-15 minutes. Remove from heat and stir in butter, lemon juice and pecans; cool. Punch down the dough and turn onto a lightly floured surface. Roll into a 10×20 inch rectangle. Spread the filling to within 1/2 inch of edges. Roll up jelly-roll style, starting with a long side; pinch seam to seal. Transfer, seam side down, to a greased 9×5 inch loaf pan, arranging in a zigzag fashion to fit. Cover with a towel and let rise in a warm place until doubled, 30-40 minutes. Preheat oven to 350 degrees. Bake loaf for 40-45 minutes or until golden brown. Cool in pan for 10 minutes before removing to a wire rack to cool completely. Confectioners’ Sugar Icing (optional): Mix 3/4 cup confectioners’ sugar and 1 tablespoon milk. Drizzle over cooled bread. Prep time does not include rising. Wow.. What a gorgeous bread.. looks yummy!! I can’t opine on the taste of the bread yet but I can certainly agree that it looks delicious. And I love your styling of the scene…the little cranberries and crumbs on the bread board are sweet details that make this photo so alluring. This bread looks amazing! Very festive and delicious! oh my goodness, i must make this soon! gorgeous! Ok, this looks amazing. Do you think it would work well as mini loaves? I’m thinking Christmas neighbor gifts… Also, I have TERRIBLE luck with yeast breads/rolls. Any advice for someone like me for this recipe?? THANKS! This looks amazing! 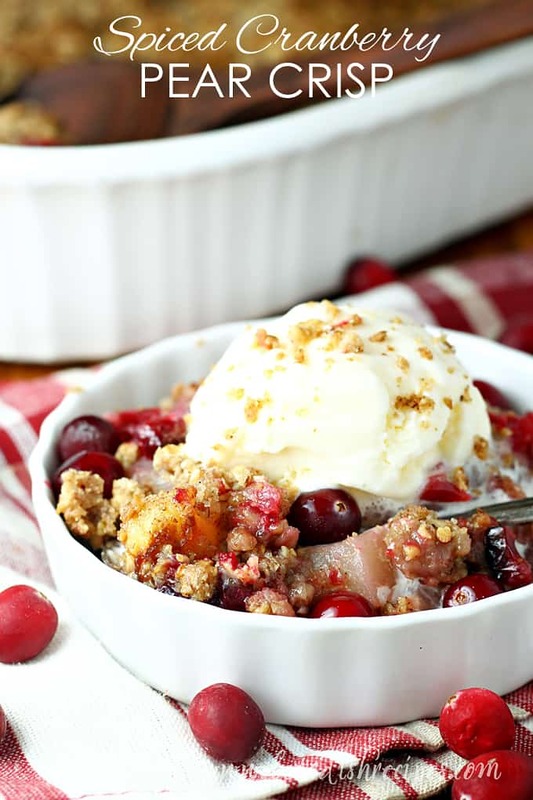 I’ve seen so many creative cranberry recipes this month and want to try them all! Just made this (it’s in the oven right now!) – but I used my bread machine to mix/knead the dough. I made this yesterday. It’s beautiful. I’m not in love w/ it yet. 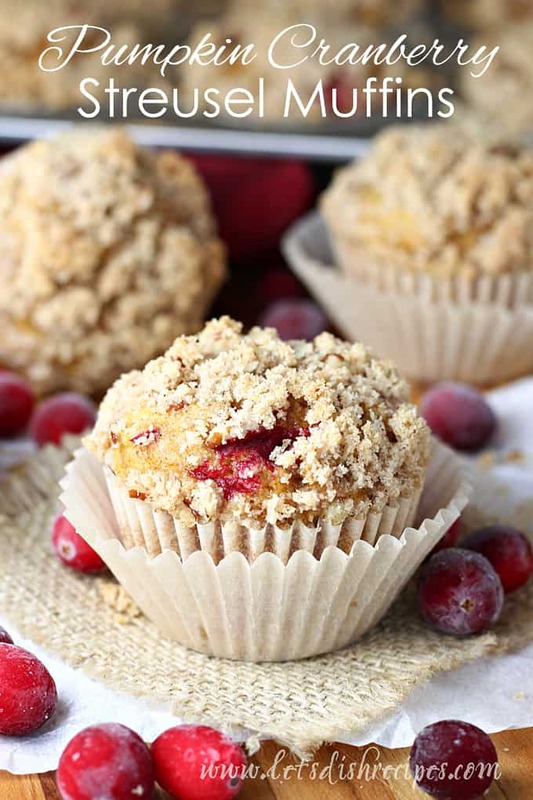 Why do you add lemon to the filling when the cranberries are already so tart? Hello! I have leftover cranberry sauce from Thanksgiving, could I use this for the filling instead of the plain chopped cranberries? Thanks! I’ve made this recipe vegan multiple times, once as is, once with blueberries, and once with both. I think the combo of cranberries and blueberries was my favorite! I cut the roll into slices and baked it in a cupcake tin. They turned out really cute. Great ideas! I can’t wait to try it in a cupcake tin!